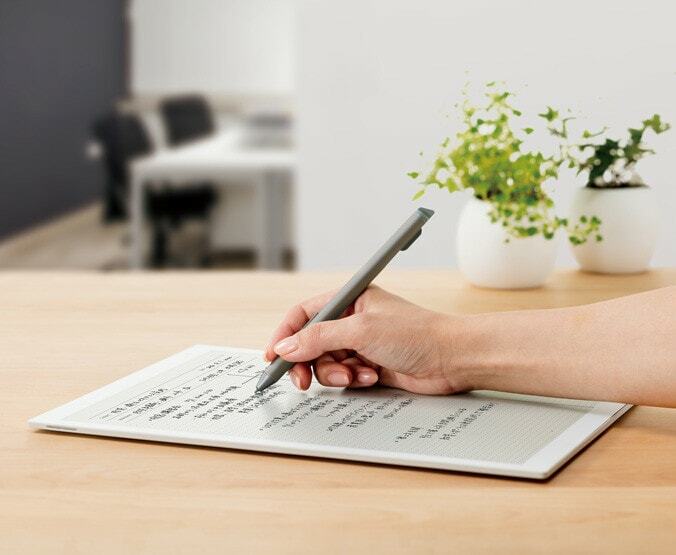 A few weeks back Sony teased a 10" E-ink writing slate in a customer survey, but now it appears they went in a different direction. Sony has just revealed the DPT-RP1, its replacement for the discontinued DPT-S1. The DPT-RP1 is about the same size and shape as its predecessor, and it has the same limited format support (only PDF), but it also has a higher resolution screen, with an improved “non-slip” panel which Sony has said will improve the experience of using the included digital pen. Sony has also dramatically bumped the screen resolution from 1200 x 1600 to 1650 x 2200, boosting the sharpness from 150 ppi to 207 ppi. The new model is also slightly thinner and lighter (12.7 ounces versus 12.3 ounces), and it also has twice the storage as well as Wifi, Bluetooth, and NFC. The previous model had only Wifi, which limited how you could get data on and off the DPT-S1, but the new model can and receive data over Bluetooth. What's more, it uses NFC to help secure your information. The DPT-RP1 defaults to locked, but wave an authorized NFC chip at it and it will unlock (me, I would rather use a password). According to The Verge, the DPT-RP1 is scheduled to go on sale in Japan for around 80,000 yen (roughly $720) on 5 June. The US release date has not been set. Great! Any news about its processor? If it is quad-core, may it run a notebook’s screen? As Sony and E Ink just signed a new Joint Venture we might see also Sony’s 10.3″ ereader. Eh. I’m not sure that actually means anything. Not long time ago you were questioning if DPT-S1 was Sony’s last one. If the Verge is right about the price for DPT-RP1 that’s 1/2 price of what DPT-S1 was announced. That would be the statement that Sony is confident in the segment and would like to mass deliver. Not like E Ink. The DPT-S1 cost a$1,100 when it was first shipped, not $1,400.